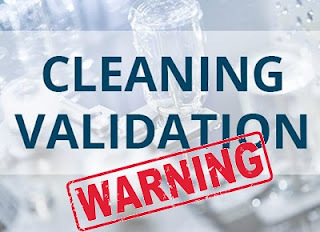 Cleaning validation remains a major concern in FDA inspections due to issuance of warning letters to different companies for noncompliance in cleaning validation. Cleaning of equipment was first published in the Code of Feral Regulations (CFR) as 21CFR211.67 Equipment Cleaning and Maintenance in 1978. After that a lot of document guidelines are published on cleaning validation and nowadays cleaning validation is the main focus area of FDA inspections. In 2014 FDA published a detailed guideline on cleaning validation i.e. Validation of Cleaning Processes that have step by step procedure of cleaning validation in pharmaceuticals. Manufacturers are trying their best to comply with these regulatory guidelines but many warning letters are being issued every year due to non-compliances in cleaning validation. Firms must take cleaning validation more seriously than other validations like process validation, equipment validation and area validation etc. I am saying this because non-compliance of other validation may cause affect the quality of the product but the improper cleaning validation will surely contaminate the product with residues of the previous one. 1. Validation Procedure: A well-written cleaning validation protocol and standard operating procedure is a basic requirement. It should have step by step procedure for cleaning validation and cleaning procedure with proper authorization. Moveable and clean-in-place equipment should be identified. Operators must be trained for cleaning of both types of equipment. 3. Risk Assessment: Risk assessment for the cleaning of equipment should be done to identify the risk involved in the improper cleaning of equipment during the manufacturing of medicinal products. It will support the company if any inadequacy found in cleaning validation and cleaning procedure. 4. Acceptance Limits: FDA has not suggested any acceptance criteria for cleaning validation. It is not possible due to the use of various APIs and equipment in the manufacturing process. It calculated on the basis of the toxicity of the API and the area of equipment. Acceptance limits should be calculated carefully. Many companies have been warned by the FDA for wrong calculations and exceeding results after recalculation. 5. Analytical Method: Analytical method used in cleaning validation must be validated and the limit of detection must be determined. Analytical method must able to detect the contaminants below the acceptance limit. FDA clearly says that a negative result may found due to the poor sampling or analysis. 6. Cleaning Validation Report: Report should be completed and approved by an authorized person. The report should include analytical method validation results as well as the cleaning validation results. A summary of the validation exercise and final conclusion must also be written in the report. 7. Deviation and CAPA: Report and record any deviation observed during the whole cleaning validation exercise. A proper corrective and preventive action must be taken for deviations. CAPA is a preferred topic of FDA inspectors. They ask for CAPA every time they found any deviation. Deviation and CAPA should be closed before the approval of cleaning validation report. Passing FDA inspections are becoming difficult year after year. The number of warning letters issued by FDA is increasing every year. All major players of the pharmaceutical field have been hit by the FDA in the last few years. Companies can make strategies to address this situation by focusing on such issues which the FDA puts on priority. Warning letters issued by the FDA due to cleaning validation issues.